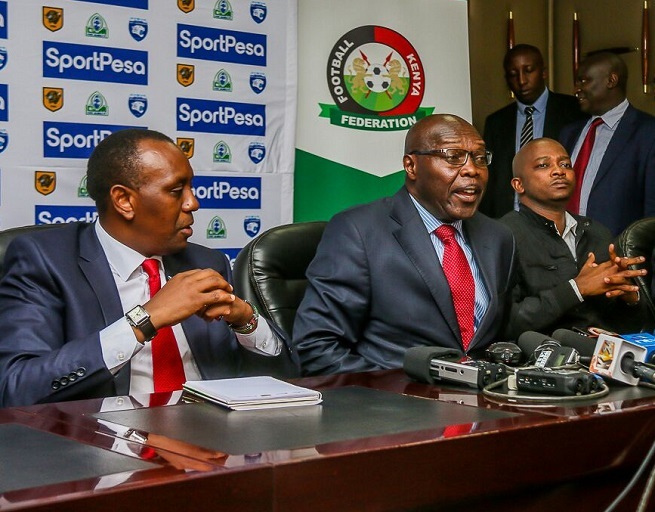 Gor Mahia are seeking a second sponsor in addition to Sportpesa to help alleviate the cost of hosting teams for Africa cup matches as well as the cost of traveling. Gor Mahia will soon announce a new sponsor to supplement what betting firm SportPesa is offering, club chairman Ambrose Rachier has said. According to Rachier, if successful in securing a second shirt sponsor, it will be welcome reprieve to their financial hiccups during these tough times. The club requires about Sh35 million to participate in the Caf Confederation Cup group stage matches. This comes after the Caf banned the club from donning SportPesa-branded kits in their 4-2 triumph over Egyptian giants Zamalek in the competition’s Pool D clash at Kasarani stadium on Sunday. The ban has been enforced to protect the economic interests of one of the tournament’s sponsors, Netherlands Antilles-based 1XBet, who happen to be SportPesa’s business rival. On another note I saw Aduda on Ktn on Sat afternoon;i was appalled.His answers on key club issues like E-tickets,player welfare was total joke. Why couldn’t Rachier wait and break the good news when the deal has materialised? I want to believe that this 100000/- promised is per player. If so then assuming that our players number 30, this will translate to 3 million. CAF is supposed to have wired in 27 million now that we are in the group stage. Now because to err is human, we assume that 1 million will be lost in “some human error calculations”. That leaves 23 million. Chairman and his band should come clean on how the 23 million will be used. Meanwhile the silence on Saturday’s gate collections is very loud. If sponsor pays salaries, then do players go for months without salaries? You can write to CAF to release the money since the money is for group stage and this is the second match. If CAF group stage is 35m and CAF has already given 27m balance of 8m we can get from gate collections in all the 3 matches without even begging the government to bail us out. Gor is not someone cow. Jasego, have the players been paid their Feb18 salaries in full? EC must come clean on gate collections, remember @BB’s call for marketing the Zamalek game which was far more important than the Hull City friendly. Now, is Pascal Ogweno the new passenger? Jasego osiepa, i mean payment Jan19 salaries for the players. SP sponsorship for Jan19 should not be diverted! Have you seen the crowds that are attending league matches nowadays? When Gor Mahia plays at Machakso for example, I think only 1000 people attend. Kenya lost the match to Tunisia 1-0, against Perumal’s orders to the team. Fifa also says that Owino conspired with Perumal to manipulate matches of the Nile Basin Tournament in Egypt in 2011. Perumal offered $60,000 (Sh6 million) for Kenya to lose its fixtures. Owino told Perumal he was not in the Kenyan team to Egypt, but would recruit two players on the squad and earn a commission. “Give me the name of a player I can trust and make things work. I will send my guys there,” Perumal demanded. Owino gave the name of a defender. not sure in gor we understand the work of a sponsor……….does CaF matches really need a shirt sponsor ? sportpesa is paying wages, gate collections and other monies pay allowances and daily training + upkeep, so what we are actually asking for is someone to finance our travels and accomodation across Africa. that someone may not necessarily be a shirt/ short or sleeve sponsor. stop the confusion ! The ban on using SP logo is unfair since 1XBet can’t finance the all operations of clubs both in/out of the CCC. A good CCC showing by GM is more exposure/advertising 4 SP which EC can bargain 4 an improved deal. Y 35m when Govt is paying 4 airtickets? I found the comparison between Berry and Bonny Omondi interesting and of which I wholeheartedly agree moreso vis a vis the Berry of now and I put it down to the fact that Berry’s heart is in what could have been (In Europe),its only his body that is in Gor , for lack of an unforseen better alternative and its practically difficult to give your best when in such a mental state, on the contrary Omondi has just began his journey and is at the mental stage when Berry announced himself to the world . The erratic Boniface Oluoch is one who is still in Gor Mahia just for the salary , no more ambitions , not even for the cup of nations coupled with his indiscipline and his natural unseriousnes , you never know which Bony will turn up on a good day , as for Shakava , the guy has simply reached the end of his potential and which in my opinion is average vis a vis our ambitions . Joash Onyango and Wendo , i prefer to reserve my opinion-for now . Wuod Asego Kanyada Ondiek gima gerr ringo kadok chien. Stay focused. Angola must fall. Musymo remember our guy who talked of Nigerian dogs being thoroughly beaten? I wish he could say the same of Egyptian dogs. @BB, you told me to treat dogs and other animalia with decorum so I will be civil to the dogs. I think our sputtering performance coupled with the brand Zamalek had poured ginene in people’s stomachs. I confess I was one of the people who gave us only a half a chance only that I did not see the need to spoil people’s mood with my pessimism. So i kept it to myself and prayed for a miracle Turns out the spirit of Mahia is still alive. I hope we keep that momentum……. Owino’s alleged match fixing accomplices are named as Julius & PASCAL. Hope this ain’t our P.Ogweno! Jasego given that GOK has been providing airtickets, RAO & Otiende have donated 550k + gate collections means the shortfall is manageable. So why/how 8m?